Win a Signed Copy of Scent and Subversion! Hello, everyone! Scent and Subversion: Decoding a Century of Provocative Perfume is in stores, shipping from Amazon, it got nice reviews from Publisher's Weekly and Now Smell This. It's also getting mentions from fabulous people like Dita Von Teese and Mx Justin Vivian Bond. I'm so excited it's finally available. And by the way, that's Dita Von Teese's '30s moon manicure and Vine up there. Here's the sweet Tweet she wrote about the book! Please help me to promote it by sharing this post on Twitter and Facebook, and you might win a signed copy! After sharing this, just leave your Twitter and/or Facebook handles in the comments section. I'll put all of your names on pieces of paper in a hat, and I'll announce a winner here in a week. Thanks everyone! Ferris Lewis aka @Dkchocoman on Twitter! Congratulations! Please contact me at yesterdaysperfume@gmail.com so I can send you a signed copy of Scent and Subversion! I couldn't think of a more fitting ambasadress than Dita for your book, Barbara. It will be nice to read in print the knowledge you have always shared here. I am sure we already have a best seller. Thank you for your kind words and continued support, Caro! Congratulations! I have been patiently waiting for the release of this book. I'm so glad youre been looking forward to it. I'm excited to share it! Thanks, Lisa! Thanks, Dominga! Is that your Facebook name? Thanks, Smelly Vagabond! (I love typing that with a barely straight face!) 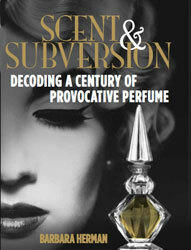 It's on Amazon UK: http://www.amazon.co.uk/Scent-Subversion-Decoding-Century-Provocative/dp/0762784385 and maybe elsewhere? I should know this... Anyway, thanks for commenting! Thanks, Kafkaesque! (Kafka's one of my favorite writers.) You're in the contest! Thank you, Damir. You're in! Congrats my dear on your release. I'm heading to Amazon right now!!! I am so happy your book is finally hitting the shelves. I cannot wait to read it! Thanks, Ferris. Hope you like it! Thanks, Scented Hound. Did you recover from Sniffapalooza? I put sunglasses on that had been in a purse filled with perfume cards and the scent of a million perfumes had impregnated the plastic! You like Kafka's works?! Combining that with the very witty or outgoing fun stuff on your Twitter account, you seem even cooler than I had thought you were back when I was scouring your Caron/Rochas/Habanita reviews! :) I hope your book becomes a NYT's bestseller. I totally want this book. It's going on my Christmas list and on December 26 I will be curled up on the couch with it and nice cup of tea and I'll be wafting something vintage to set the mood too. At long last! I really look forward ro reading it! I have mentioned it on Fashionable Forties FB-page. https://www.facebook.com/#!/pages/Fashionable-Forties/199185596809563 as well as on Twitter were my handle is Isis. Oh, I love your blog, Isis. Thank you. Youre in the contest! How exciting! Congratulations and good luck! Happy to have found your blog, since I love vintage perfume! Great, Britt. Glad you found the blog! You are in! Whether I win or not, I am SO getting this book, bbut here's hoping! I shared the info on the TAG page..;) And super congratulations! Congratulations! I look forward to reading your new book! And am happy to have been introduced to your blog. Vintage rocks. Hi Cristiane, are you on Facebook or Twitter? Yes, sorry. I think that you could see that i made login using facebook. Loved meeting u at Sniffa.Sniffing the vintage Bandit! Ah!! Really looking forward to enjoying ur book. Thanks, Sonia. Ha- you were one of the few who smelled Bandit! Awww, thanks Linda. I hope you enjoy it! I shared it on Facebook. My name is Laurie Brown- not sure how you tell me from all the other Laurie Browns there, tho! You are entered to win Laurie Brown! I'm @breathesgelatin on Twitter, and I shared!! Can't wait to read. I can't wait to actually read the book (whether I'm lucky and I win it or through purchasing it). Thank you so much for the draw, and congrats again! I've been anxiously awaiting your book. I tweeted this, and my twitter name is anotherfumeblog. Hotlanta, maybe a box cutter? Cardboard can be tough. Enjoy the book once its out! No need to enter me in the draw because I received my signed copy already and can't wait to read it! Congratulations on the release of the book! "death by abstentia in perfume blogland" perfectly describes my life for almost a year now....sad that I missed all the excitement around the much awaited release of your book....congratulations (if I haven't said it already!) !!!! !